This is a web site focused on “Backyard Beekeeping.” The focus of backyard beekeeping is on keeping a single hive or possibly two for the primary purpose of enjoying bees, observing their behavior, and enhancing other domestic endeavors (such as gardening). There may be an objective of collecting a bit of honey as a part of the hobby, principally for personal use and to share with a friend or two. Backyard beekeeping is not concerned with supplementing the beekeeper’s income or providing resources for the beekeeper’s other commercial interests (such as collecting wax for a cottage candle or soap making business). Keeping bees for these types of efforts is typically considered ‘sidelining.’ It is also not about producing honey for sale (even if it is just local fruit-stand type sales or sales at a table in a trade show or fair). It is definitely not about commercial honey production or large scale pollination of farms and orchards. All of these efforts need to have a focus on costs vs. income. Success in all of these efforts can be measured by income being greater than expenses. There is absolutely nothing wrong with this. This is not, however, the reason that hobby beekeepers keep bees. So why would this difference in objectives make a difference between commercial or sideline beekeeping and backyard beekeeping? What difference should this make to a backyard beekeeper? After all, isn’t keeping bees the same regardless of the motive? I think that one of the most important places to keep the distinction in mind is when a new beekeeper asks for advice on beekeeping practices (or reads internet blogs or forum posts). A common refrain is that if you ask three beekeepers a question that you will get five answers. Which of those five answers is right comes down to understanding the objectives that are assumed in each of the answers and how they fit into your beekeeping objective. A simple example of this difference might relate to how a beehive should be painted. 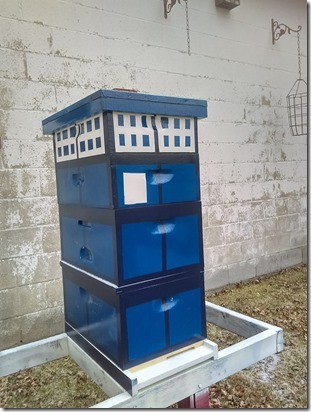 A commercial beekeeper is going to have an answer to how hives should be painted that merely protects the wood that can be mass replicated (hundreds of boxes) with minimal labor. A new beekeeper should not assume that because an advisor keeps hundreds of hives successfully that his/her solutions are appropriate. A more critical factor to a backyard beekeeper may be an aesthetic solution that a spouse finds attractive or even whimsically cute. 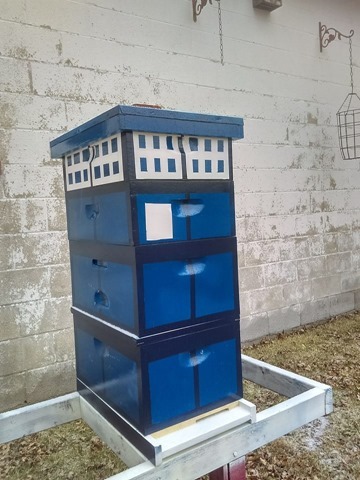 A commercial beekeeper could not stay in business if hours were spent on each box to make them cute or attractive. For a backyard beekeeper however, creativity may be the difference between the hives having a good location in the yard or being hidden in a shady ditch. Cost effectiveness also a critical factor in how commercial keepers inspect and maintain beehives as well as how they treat for diseases and pests. Just because a solution is absolutely right for a commercial operation does not make it the right answer for anyone else. The focus of the pages on this web site are on backyard beekeeping. Many of the ideas and suggestions here would be strongly argued against by a commercial honey producer or the operator of a major pollination operation. Just because they can’t afford to have fun keeping bees does not mean that you can’t. The second key focus of this web site is raising bees in a sustainable fashion. Huhh?? If you have an interest in honeybees you are most likely aware of the problems that these bees are encountering trying to survive in our modern shrunken world. Varoa mites, Colony Collapse Disorder, Deformed Wing Virus, and on and on. Based on the only statistical information that we have available it would seem that over 60% of the bee colonies in Maryland died last year (2017). There are indications that hive mortality has been significant over the past decade. To keep the doors of beekeeping businesses open, the answer to this issue is to acknowledge the losses and buy new packages of bees each spring. The commercial beekeepers have to factor this additional cost into their budget but it seems to be working for many of them. For a backyard beekeeper this approach translates to a beekeeping process where boxes are filled with shipped in bees in the spring and they die in the winter. New bees are then bought the following spring and the cycle continues on (half of the time at least). Kind of like buying expensive perennial flowers to replace the ones that you bought last year – every year. Sustainability is about producing enough bees in such a fashion as to cover anticipated losses. This is one of the reasons (not the only reason by all means) that new beekeepers are never encouraged to start with just one hive and to start with at least two hives. The solution that this site proposes is that a backyard beekeeper should keep a separate nuc (small colony) for every hive in the apiary, so the answer here is that a backyard beekeeper should have 1 1/2 hives. This is not a cynical attempt to compromise on the number of hives. Using this approach, a backyard beekeeper should be able to keep a hive that produces some honey as well as replacement bees (insurance) to cover losses in all but the extreme years (there are no 100% guarantees in agriculture). This approach should also allow the backyard beekeeper to produce replacement queens to keep young, productive queens in the apiary without having to hunt for and purchase replacement queens. It is not intended as an approach to growing an apiary. It tries to keep the number hives and bees consistent from year to year. There is nothing here that says not to do a split of the main hive if the beekeeper wants to increase the number of hives. It does, however, recommend that if a new hive is added that a new nuc should be introduced as well. In a good bee year, success for a backyard beekeeper may actually be generating a successful swarm (with an appropriate queen) that finds a place in the wild while the original hive rebuilds to survive the winter to swarm again the next year. Recommendations on how to do this are few and far apart.